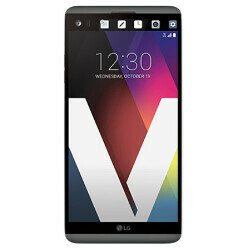 LG V20 appears on T-Mobile's website; high-end handset listed as "coming soon"
The LG V20 is not expected to be released until October 21st, which happens to also be the date when the "safe" Samsung Galaxy Note 7 becomes available for new buyers of the device. That happens to be exactly one month from today. Meanwhile, T-Mobile already has the phone listed on its website as "Coming Soon," although pricing is not revealed. The LG V20 carries a 5.7-inch display with a 1440 x 2560 resolution. A 2.1-inch secondary screen is "Always On," and the Snapdragon 820 chipset is under the hood with a quad-core 2.15GHz CPU and the Adreno 530 GPU. 4GB of RAM is inside along with 64GB of native storage. A 2TB capacity microSD slot is available for those seeking additional storage. While the LG V10 had a dual-camera set up in front, this time it is on the back. There are two 16MP rear-facing shooters with a 5MP wide angle selfie shooter in front. A 3200mAh battery keeps the lights on and Android 7.0 is pre-installed. If you are planning to make the LG V20 your next phone and want to learn more about it, you can check out T-Mobile's website by clicking on the sourcelink. This is T-Mobile, where decent handsets go to die months after you bought them. It's been on their site since Sunday. Oh yeah the best of korea's finest handsets on the same day..one that go boom and the other that don't..
Yeah much like one joke is funny the other is just old s**t that stopped being relevant. I would say it's actually October 19th, since that's what the picture on T-Mobile's site show with the date on the phone.